I hated pickles when I was a kid. My only exposure to them were as sour neon green disks the invaded my McDonald’s cheeseburger. I really don’t know when the switch got flipped in my brain that made those flavors acceptable. It must have been sometime in my early teens. That’s when I would start to look forward to going to the county fair each year because I could get a fresh pickle the size of my forearm and eat it in place of a proper lunch. Today is the last day to place an order before the Biff store goes on vacation! Order your books today if you want them to be shipped in 2008! but pickles are nutritious, they have vitamin e k l p i c and s in them! Disney reference FTW. Sux to be Biff! I’ve always loved pickles. Even before I got my first chance to try home-canned bread-and-butter pickles or watermellon pickles, I loved them. I’d even drink the brine. My Grandmother came to live with us when I was still quite young; she was the Grand Dutchess of canning, and the Empress Paramount of pickles. We had more awesome pickles than we could easily find shelves for, and she filled the basement with the canned output of our gardens. While I still love a good pickle now and again, I’ve quite taken to other pickled vegetables. Pickled garlic, pickled, carrots, pickled, cabbage, etc. How is biff going to get out of this little pickle? Haha… ha… it’s a pun! Perhaps he can still escape, if someone accidentally leaves the lid…ajar! On a less punny note: my gosh, did Biff even think about this wish? WHOO HOO! I HAVE A SNOW DAY!!! 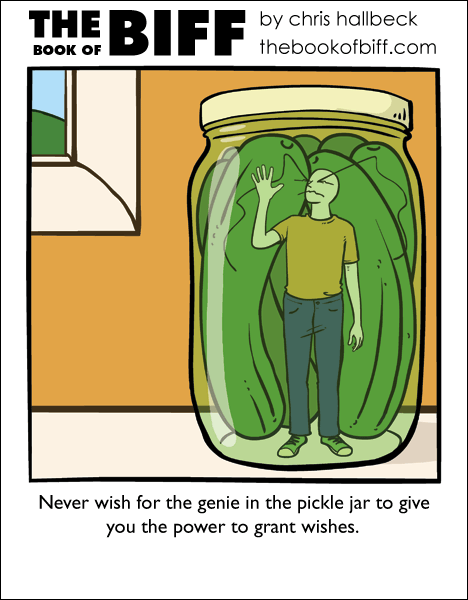 And who would wish for the power to grant wishes? Everyone knows you wish for more wishes. Ugh, all the good ones have been taken! That’s what I get for showing up late. I had the opposite problem with cottage cheese. I used to like it, then one day I ate it and it didn’t taste good to me anymore. Biff’s home has been taken away from him and he lives in a pickle jar…because he forgot to pay his dills. I love pickles, my mom used to make them when I was little and she had to hide them or I’d eat a whole jar of them…then wash it down with milk. Oddly this never made me sick. Jackson – If Biff ever thought, we wouldn’t have a comic. But the brine will take years off his complexion! @Signum I guess his fate is sealed. Pickles are actually green and slightly acidic capsules of pure awesome and win. Don’t ever forget that. I’ve always liked pickles & gherkins. I can’t explain why. I STILL hate pickles. They’re evil zombie cucumbers that are trying to take over the world.